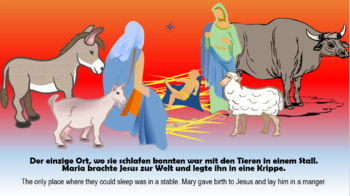 For your Christmas lessons, you may wish to consider going over the Nativity in German with your students. This is a festive way to practice and learn some new vocabulary and if it is a little bit difficult to understand for some students, I have included the English translation on each slide. This translation will appear after each click. I hope you and your students enjoy this PowerPoint. 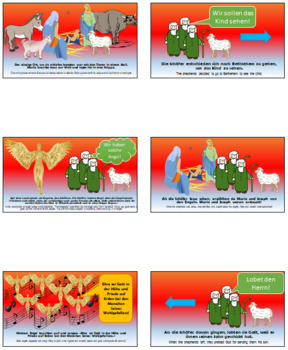 Now includes full audio for each slide in both German and English - Just click in slideshow mode to play the audio. 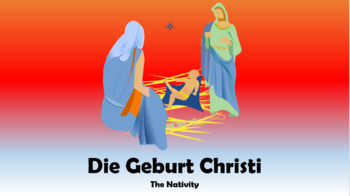 (Wait for the German audio to finish after clicking once before clicking again, otherwise both German and English tracks will play on top of each other!) Check out the video for a sample of the audio.